Almost every day I look at the traffic sources for my blog. I can see what search words were used to find my site. One name which keeps cropping up is Jane Cromwell Pickering. I had written a blog post about Giles Cromwell of Newbury, Massachusetts in which I talk about his background and why he is not Giles Cromwell son of Sir Oliver Cromwell. This gross error is to be found everywhere on the internet, and especially on Ancestry.com. Although Jane is not in my family tree, and since I had so much trouble with the family, I decided to check her out. What I found was the same nonsense written about my Cromwells. And not to beleaguer the point, if you would just do a little independent research, instead of taking everything as gospel, you would reach these same conclusions. So here are two Jane Cromwells. 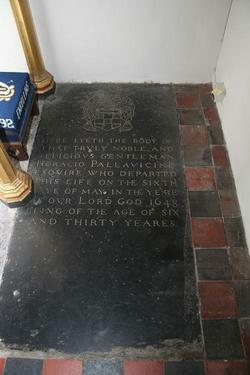 Jane Cromwell, daughter of Sir Oliver Cromwell and Elizabeth Bromley, married in All Saints Huntingdon, on April 24th, 1606 Toby Pallavicini, the same day her sister Catherine married Henry Pallavicini. Jane was 11 years old and her husband was not quite 13. In effect, two very young sisters married two equally young brothers. The brothers were the sons of the girls' step mother, Anna Hooftman Pallavicini Cromwell. Sir Toby became fantastically wealthy when he inherited both his father's and his brother's estates, but squandered his money and ended up in the Fleet prison for debtors in 1637. His wife Jane died 23 March 1637, at the age of 42 and is buried in the church of St. Martin, Chipping Ongar, Essex, England. Her son Horatio Pallavicini, Esq. is also buried in this church. I am willing to state that Jane Cromwell Pallavicini never set foot in Newbury, Massachusetts and never lived in the Massachusetts Bay Colony. Period! My second Jane of this blog is Jane Cromwell Pickering, her name seems to be frequently googled. Jane was the daughter of Thomas and Anne Cromwell of Wiltshire, England. The family lived in Malmesbury in the northwest corner of the county of Wiltshire. This family is not connected in any way with the Cromwell's of Huntingdon, Cambridgeshire, this includes the family of Oliver Cromwell the Protector and his uncle Sir Oliver Cromwell. Thomas' parents were John and Edith Cromwell. He was a Burgess in the town. John died in 1639, dividing his estate between his wife and sons, Thomas, Richard and Phillip who was "out" of the country. He left money to Phillip's son John, in the care of his grandmother Edith. Phillip seems to have abandoned his family and he was admonished in the Colony for not living with his wife. Thomas and his family emigrated to the Massachusetts Bay Colony about 1652, they brought with them Phillip's son John. Thomas was a tailor by trade and he set up shop in Salem. His brother Phillip was a butcher. By 1652, Oliver Cromwell, the Protector was in complete control of England. This was a period of reverse migration of staunch puritans from Massachusetts back to England. Those who continued to emigrate to the Colony probably did so for economic reasons. Jane, born about 1649, she was baptized on 4 July, she was only about 3 years old when her family sailed for America. She married Jonathan Pickering on March 19, 1663 in Salem. Her father Thomas died in March of 1686. Her mother Edith lived with Jane and her husband. Jane became a full member of the Salem church in August of 1694. Jonathan her husband died in 1729. There is one website in particular that seems to promote the idea that all Cromwell's in America must be related to Sir Oliver, and I won't name them but I will tell you what they said when I asked why, despite obvious evidence to the contrary, do they continue with these assertions. Their answer was "because it gets people to my site and it's good for business". How's that for dedicated genealogy! Mary Stevens, daughter of John and Katherine Stevens married firstly John Osgood. He was the son of William and Elizabeth Osgood of Salisbury. William was a very prominent man in the town and presumably his son was quite the catch. John was born in Salisbury in 1648, twenty years later he married Mary, she was born in 1647, also in Salisbury. John and Mary were married for 15 years and had six children before his early death on November 7 1683 at age 35. Mary, a still relatively young woman with small children remarried August 25th 1685 a man ten years her junior, Nathaniel Whittier. Nathaniel was the son of Ruth Green and Thomas Whittier of Haverhill, he was born on August 14 1658. They had only two children, probably because of Mary's age. The first child Reuben was born March 17 1686/7. His birth must have been less than nine months after his parents marriage as they were presented and fined in court for fornication before marriage. Their second child was a girl named Ruth b. Oct 1688. Nathaniel took the Oath of Allegiance in 1677 in Haverhill and was admitted as a Freeman in 1690. Mary and Nathaniel's lives had a brush with history during the Salem Witch Trials. In 1692 her name was on a list of witnesses called to a court of Oyer and Terminer for the trial of Susanna Martin. It is not known what, if any, testimony she provided, she did not testify at the actual trial. One of the key witnesses in the Martin trial was a man from Salisbury named Joseph Ring. He told lurid tales of witches and shape shifting and all manner of scary stuff. Susanna Martin was found guilty and hanged, Joseph Ring was killed by Indians in 1704, Nathaniel would marry his widow a few years later. On a positive note Mary and Nathaniel both signed a petition to free Mary Bradbury, another accused witch, she survived her ordeal when she was "spirited away", she is also one of my ancestors. Mary Stevens Osgood Whittier died May 11 1705. Nathaniel married second Mary Brackett Ring, daughter of Captain Anthony Brackett, widow of Joseph Ring of Salisbury. Mary was the grand daughter of Anthony Brackett who was killed in Brackett Lane Massacre on Sandy Beach. She herself had been kidnapped by Indians as a young girl but had escaped. You can't help but wonder what sort of emotional scars were left by all the horror and tragedy of her life. Nathaniel died July 18 1722, his widow in 1742. This line continues with Reuben Whittier and his wife Deborah Pillsbury. There's nothing I like better than a load of botched genealogies to sort out and here is another one. I am descended from John Stephens (Stevens) of Salisbury, Massachusetts and his wife Katherine. A quick search on Ancestry.com and other internet sites reveal a mass of confused information. At the heart of this mess is the fact that there were two John Stevens arriving in Massachusetts at almost the same time and combined with sloppy research, or copy and paste genealogy as I call it, the two men's lives have been mixed up. So here is what I have been able to sort out. This John is not my ancestor. 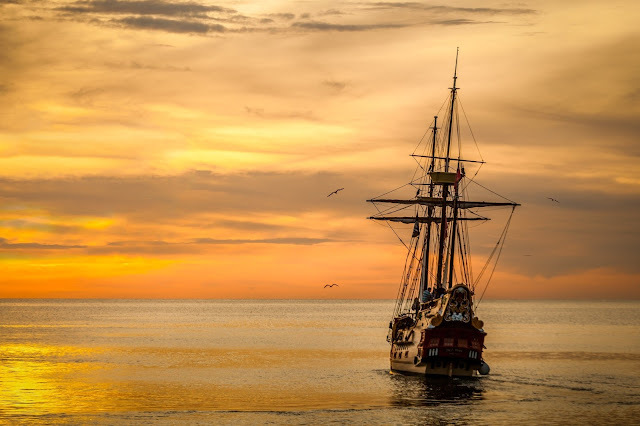 He and his brother William, wife Elizabeth, mother Alice and two servants, John and Grace Lovejoy, sailed in April 1638 on the Confidence of London. The Stevens' as well as the Lovejoy siblings were from Caversham, Oxfordshire, England. They settled first in Newbury but John and his family were in Andover by 1645. A widow, Anne Stephens, died July 17, 1650 in Newbury. Hoyt in his Old Families of Salisbury and Amesbury, suggests that this might possibly be Alice. William had stayed in Newbury, so it is could be that she was living with him. He died in May 1653, leaving a wife and young son. John did his civic and military duty as was required of him. In 1649 he served on the Grand Jury in Ipswich, he was also a witness that year in a case against the town of Andover, something to do with roads. In 1658 a petition is presented in court by the men of Andover requesting that John Osgood be appointed Sergeant and Commander in Chief in place of Sgt. Stevens. John died April 11th 1662, aged about 57, in Andover. Elizabeth his widow died quite a few years later in May 1691, age 80. Many family histories give her name as Parker, as she referred to Joseph Parker as her brother in 1673. Hoyt offers the following: she was Joseph Parker's sister, Joseph Parker married John Stevens' sister or Joseph Parker married her sister. I don't think that any of these have been proved. A Nathan Parker helped inventory the estate of John in 1662. 4.Humfrey baptized 19 June 1608. Not sure if this is of the family or not. His surname is noted as STEVENS als ATWELL son of John. Later in the PRs another baptism for a Henry HAHTWELL had a paragraph attached to the entry. It said he was born at his grandfathers house who's surname was IREMONGER. Curiously John STEVENS/ATWELL disappeared and a John IREMONGER was baptizing his children. So perhaps not the John above? 6.William baptized 1 September 1616. This message was posted 13 Feb 2009 by Lyn Somerset. If the information is authentic and it seems it is than this is most likely the immigrant family of John, William and Alice their mother. This is my ancestor. This John Stevens was born c. 1611 in England, county and town unknown. It is not known when he arrived in Massachusetts but he was one of the first settlers of Salisbury, Massachusetts. According to Hoyt he received land in the first division in 1640. His name is found on the plat map of Salisbury. He seems to have been a single man when he arrived, and as single men were not allowed to live on their own he quickly found himself a wife. He married Katherine Unknown in June of 1639. She is said to be Katherine Codman. In July of 1646 John was deposed at the Quarterly Court and in his testimony he said he went to his "Brother Codnam" to make an inquiry about a hoghead of beef. In August Robert Codnam was also deposed in the case. Hence the belief that Katherine was Robert Codman's sister. John performed many duties for the town of Salisbury. In 1644 he was a surveyor for roads and was asked to find out what trees had been cut for pipe staves against orders. In 1645 he was chosen one of the Prudential men. Prudential men were given authority to conduct all the town business except the giving out of land. As a surveyor he was given authority to empower men to help fix the roads, this was necessary as the men were so busy trying to clear their land, plant crops, maintain their cattle, that they did not want to take time away from their farms to work on roads and fences. John was once fined for disorderly speech in a town meeting, no idea what he said. John was sworn constable at the 1647 court at Ipswich. He was a witness in court in 1647 when the town of Newbury was presented for failing to provide a safe from the new town to the ferry side. He was deposed in court in 1667 and gave his age as 56, this is where the 1611 birth date comes from. John Stevens died in Feb of 1688/89, his wife Katherine had died July 31 1682. 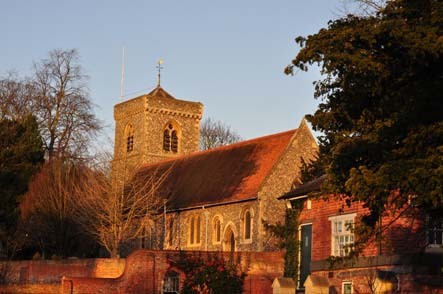 John became a member of the Salisbury Church in the last years of his life. My Stevens line ends here. Mary Stevens married Nathaniel Whittier. under the command of Mr. John Johnson. On board were 100 souls "intended for New England", including John Rolfe, age 50, husbandman, of Melchitt Park, Wiltshire. Accompanying John were his wife Ann, daughters Hester and Joane, and servant Thomas Whittier. The other passengers were similar family units, mostly from Wiltshire and Oxfordshire. The men were tailors, tanners, merchants, linen weavers, yeoman and husbandman like John Rolfe. Unbeknownst to them at the time, the future husbands of Hester and Joane were also sailing on the Confidence. ( Hester married John Sanders and Joane married Richard Ring, both fellow passengers.) Whether John Rolfe and the others left for religious or economic reasons, or a combination of both, most of them would never seen England or the families they left behind again. The Rolfe and Whittier families had lived in Wiltshire for seemingly hundreds of years. Their names are found in the parish registers of Whiteparish, Downton and Lanford. These villages are on the edges of the New Forest, a royal hunting ground created in 1079 by William the Conqueror. They are also within 15 miles of Salisbury and close to the port of Southampton. On 23 January 1608/9 Mary Rolfe of Whiteparish married Richard Whittier of Sarum. It is possible that they were married in the Church of All Saints in Whiteparish. That church was built in 1190 and is in use today. Mary Rolfe was the sister of John Rolfe who sailed on the Confidence in 1638 and Thomas Whittier was her son. Mary was the daughter of John and Honor Rolfe of Whiteparish. John was born c. 1550, he and Honor had at least four children who lived to adulthood. The eldest was daughter Joane b. 1579, followed by Mary b. 1582, Henry b. 1585 and last John b. 1589. Honor died in 1619, her July 8th burial is recorded in the Whiteparish parish records. Her husband John wrote his will in January 1624/5 and added a codicil in May 1625. The inventory of his estate was done in October of 1625. It is clear from the will that he did not own any land, rather he leased various parcels for long periods of time. These leases he passed on to his sons. If you look closely at a map of the area around Whiteparish you can still find place names mentioned in his will, like Rumsey Lane, Bushy Copse and Mort (Moor Farm). John left his grandson Thomas Whittier a "stall of bees". Richard Whittier,Thomas' father, was probably born in Landford, a short distance from Whiteparish. He and Mary had at least three children, sons Richard, John and Thomas. There is a burial for a Richard Whittier in 1634, it is possible that this was Thomas' father. Not much else is known about the family, neither of Thomas' brothers emigrated. Although he was listed as a servant, it is impossible to know exactly what Thomas' status was in the John Rolfe household. It is likely that John paid for Thomas' passage, John had only two daughters and he would need help establishing a homestead in Massachusetts, but thats all speculation. Henry Rolfe, older brother of John was the first of the family to emigrate. It is not known exactly when he and his wife Honor left England, but his son Benjamin was born in Newbury, Massachusetts in 1638. Henry did not live long in his new home, he wrote his will in December of 1642 and died by January 28th. He left his kinsman Thomas Whittier a swarm of bees. What is it with Thomas and bees? In the book The History of Newbury, the author write that Thomas Whittier arrived with his swarm of bees, causing a lot of excitement. John Rolfe and family arrived in Boston and by 1640 he received land in the first division of the new town of Salisbury, Massachusetts. His son in law, John Sanders, was one of the original twelve grantees in September of 1638. It also seems he married Hester Rolfe that same year. John stayed in Salisbury for some years before moving to Newbury. Thomas almost certainly lived with his Uncle John until he married, as single men were not allowed to live on their own, they were required to live with a family. His marriage to Ruth Green was not recorded so it is not certain when they married. Their first child, Mary, was born in October of 1647 in Salisbury, so it was some time prior to that date, probably in 1646. His next child was born in December 1649 in Haverhill, there is some researchers who also have him living in Newbury, but he was given a license to make tar by Salisbury in early 1649. Between that date and the Haverhill birth it seems hard to squeeze in any time in Newbury. His Uncle John did move to Newbury, and spent the rest of his life there. Interestingly, John Sanders returned to Downton, England permanently. By the time Thomas moved to Haverhill, he was about 30 years old. Married with two children he began to participate in the civic duties of the town and colony. The town of Haverhill was then about 10 years old. In a list of townsmen in 1650, Thomas was said to have 80 pounds worth of land. 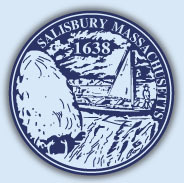 In 1650 the town appointed a committee to work with the town of Salisbury in laying out the bounds between the two. This committee failed to get the job done and a new committee was appointed by the General Court in 1651, Thomas was a member that committee. They presented their report to the General Court in May but the two towns continued to dispute the boundaries until 1667 when the General Court made a final ruling. In the year 1653, the General Court passed an act, to restrain unfit persons from preaching the gospel. This law was occasioned by gross irregularities, as they were then regarded, in the conduct of two men, living in that part of Salisbury, which is now the town of Amesbury, who were accustomed to exhort the people on the Sabbath, in the absence of a minister. Many of the people disliked this law, regarding it as arbitrary and far too severe in its positions. Among those was Lieut. Robert Pike, of Salisbury, who did not conceal his views, but spoke with some severity of the magistrates and deputies, by whom it had been made. The language used by him was regarded as a slander upon the court, and Lieutenant Pike was not only heavily fined, but also disfranchised, and put under bonds for good behavior. Petitions, numerously signed, were sent to the General Court, not only from Salisbury, but also from Newbury, Haverhill, Andover and Hampton, praying that the fine and punishment might be remitted. The General Court was very displeased with the petitioners and they were forced to meet with a committee to explain their actions. Only a handful of men, none from Haverhill, stood with Robert Pike, most of the 100 or so petitioners admitted their "offense" against the Court. Robert Pike was eventually forgiven, several years later. The next decade saw big changes in the way land was handled in Haverhill, and other towns. Men were beginning to seek true ownership of their land, buying selling and accruing land, not just satisfied with what was allotted them. Thomas continued to accrue land and 1688 he built a new home on his lot of 148 acres near Fernside Creek. In 1664 Thomas' Uncle John Rolfe died in Newbury, he left money to Thomas for his children and he also left money for Thomas's brother Richard and his son John. Obviously the families in the two countries kept in touch. 1666 Thomas took the Freedmans Oath. In 1675 Thomas was chosen to be on a committee to decide which houses should be made into garrisons. These fortified house were used as a refuge in times of hostilities with Indians. Thomas and his family were never involved in any Indian attack but other in Haverhill were not so lucky. It has been suggest by other authors that this was because he always dealt fairly with the Indians, but I'm not sure that that is something that can be proved. It is also suggested by some that he was a Quaker, however he was on a committee to repair the meetinghouse in 1681 and that would surely not have happened if he was a Quaker, at least at that time. Thomas died 28 November 1696 and Ruth on 7 July 1710. They had 10 children. Joseph Flanders was the fifth child of Stephen Flanders, Jr. and Abigail Carter. He was born in 1677, he would lose his father in 1689 at age 12. Not much is known about him, according to The Daily News of Newburyport, in an article about his son, he was a potter by trade. The article also said that he bought land in 1699 from William Osgood. We do know that he married three times. As his father before him, Joseph died in middle age leaving young children. Mary Flanders his daughter married Reuben Whittier. This is the end of the Flanders line in my family. Next up is the Whittiers. If you know anything more about Joseph Flanders send it my way. please. Stephen Flanders, Jr. was the first, or possibly the first surviving, child of Stephen Flanders, Sr. and his wife Jane Unknown. His birth was recorded in the Salisbury records as 8 March 1646/7. This does not mean that he was necessarily born there, just that it was recorded there. In any case, he spent most of his life in Salisbury. He married on 28 December 1670 at about age 24 to Abigail Carter, daughter of Thomas and Mary Carter, also of Salisbury. Mary Carter was born in Feb. 1653 which puts her at age 17. Stephan apparently lived on land a joining his fathers place. He and his brothers cut hogshead staves to earn money as well as farming. In 1673 he, John and Phillip, his brothers, were accused by Nathaniel Ware of Hampton of stealing his 1100 hogshead staves, the court found for Nathaniel and the brothers were admonished and fined. It seems likely that they cut down trees on Nathaniel's lands to make into staves,quite possibly by accident, especially if their lands backed up to each other. It seems if all of the Flanders family appeared in court at one time or another. Stephen's sister Naomi was in court in June of 1683, she testified in the cast of Priscilla Wilson and Samuel Appleton, Jr. who were accused of fornication. Naomi was a witness to the birth of the baby, which was born in her master's house. She being the servant of Samuel Stocker at that time. She, Naomi, was herself accused of fornication and found guilty in June of 1684. She gave birth to an illegitimate son, John Darlin, Feb. 21, 1683. It is possible that her sister Mary also had an illegitimate child, Phillip Favor. Stephen Flanders Sr. died in 1684. Stephen received one third of his father's meadows, one barrel of cider per year until he removed his three apple trees. If anyone has seen a copy of this will, please pass it on, I would really like to see all the details. Sadly, Stephen Jr. died only a few years after his father, leaving his wife Abigail with nine children to raise by herself. The oldest 19 the youngest only a year old. An inventory of his estate was done in May of 1689 but the estate was not divided until 1708. Abigail received her widow's third, Phillip was to care for her and receive her share when she died. The rest was divided among the remaining children. Abigail died sometime after 1718, she does not appear to have remarried. So, why is it that everyone wants an Indian Princess in their family tree? This is the second one I've found and had to prune her out. Don't get me wrong, I would welcome any genuine Indian heritage that would add a little spice to my seemingly 100% European genetic makeup. But come on, a princess, please! Everyone knows that Indians didn't have princess'. Anyway, here is what I have been able to piece together about Stephen Flanders and his wife Jane, who was not an Indian Princess. The date and place of birth for Stephen Flanders and his wife Jane are unknown. A lot of family "legends" about his origins can be found in books and on the internet if you're interested in searching for them, I however, am trying to stick to the known facts so I'll leave them alone. The only thing I will say is that the name Flanders was found in England at the time, so it is entirely possible that Stephen was English and not Flemish as so many source purport. The next record of Stephen is in Salisbury, Massachusetts. He was not one of the original proprietors, but he was a listed in 1650 as a Salisbury Commoner; he was taxed in 1652. He received a share of Mr Hall's Farm when it was divided among the men of Salisbury. In 1658 he was a signatory on a church petition. Here is where I am going to jump off and talk about some of the stuff written about Stephen. Well, excuse me for being a Catholic, Edith! Okay, so what do I dislike about the above statement. In 1658 there are only about 60 or so men in Salisbury, and 50 of them sign the petition, many of them faithful Puritans. These were hardly radical dissenters. In fact in 1667 there are only about 10 men who are actual members of the church. This does not mean that the others are not active members. Everyone had to go to church. In order to become a "member" one had to undergo a severe scrutiny by a panel of church elders regarding their religious convictions. Most men were adverse to such an ordeal. So other than this letter of petition, how does the author know that he did not participate in the church? Why is it natural to assume he was a Walloon? 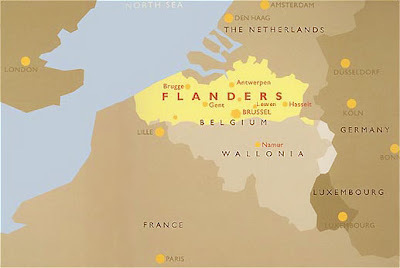 Wallonia was not Flanders, it was the French/German speaking part of Belgium. Besides, the Puritans were quick to run anyone who disagreed with them out of the colony. Obviously this was not a major breach with the church. In fact it was a petition to request a separate church from Amesbury, hardly a crisis of faith. Okay so what I am saying here is that you can't take a few bare facts and mix them up with a family legend and try to read between the lines. Back to the facts. In 1677 Stephen signs yet another church petition, signatory's are described as either householders or brethren i.e. church members. Also signing the petition was his son Stephen Jr. Finally in a 1680 Norfolk County Petition he was a signatory along with his sons Stephen Jr., John and Phillip Flanders his sons. So now how about a little bit about Jane. Oh, Jane, you sound like you were a real piece of work. Jane was not an Indian Princess, she was almost certainly not an Indian, and her name was not Sandusky. There is no tribe of Indians called the Sandusky. There were Indians who lived along the shores of Lake Erie, in what is now Ohio, along the Sandusky River. These Indians were most likely the Erie. Since the word "Sandusky" was not applied to the area until after the mid 1750's, it is not possible to associate it with Jane, who was born in the first quarter of the 17th century, say 1620. We know that Jane was threatened with court action in Kittery for her behavior, this did not change when she moved to Salisbury. She was in court multiple times for "railing carriages and misbehaviors". She got into name calling spats with her neighbors, they threatened her, she threatened them. She admitted in court to being "distempered in her head". At least twice the court ordered that she be whipped for her deeds. At first glance it would seem that she was a very unpleasant woman, and maybe she was, but maybe she was an overworked, chronically pregnant, stressed out, unhappy woman. Stephen, her husband was also in court for "breach of the peace", maybe he was the source of her unhappiness, who can say. I think we cannot possibly judge this woman based on her court appearances and to say, as some have, that this somehow is proof of her being an Indian is an insult to her, to all Indian women, and to me, smacks of racism. Jane died, whether railing at the world or at peace with God, on November 19, 1683. She was followed by her husband the next year on June 27, 1684. 2. Mary, born May 7th, 1650, married Freavor. 3. Phillip, born at Salisbury, Mass., July 14th, 1652. He married a widow, Martha Collins. There appears no record that they ever had any children. 4. Sarah, born in Salisbury, Mass., November 5th, 1654. She married John Newhall. 6. John, born February 11th, 1659. Married Elizabeth Sargent, probably the illegitimate daughter of Sarah Osgood and Thomas Sargent. They had nine children. I think it is interesting that all the children are given good English names and nothing that sounds remotely Dutch. What do you think? Samuel L. Boardman, "Extracts From The Early Records Of Georgena; The First Incorporated City in America," The New England Historic and Genealogical Register, (Boston: New England Historic and Genealogical Society, 1881) 35, 43, American Ancestors (http://www.americanancestors.org : accessed 8 November 2015). David Webster Hoyt, The Old Families of Salisbury and Amesbury, Massachusetts: With Some Related Families of Newbury, Haverhill, Ipswich, and Hampton, and of York County, Maine. (Baltimore: Genealogical Pub., 1982), 11. Edith Flanders Dunbar, The Flanders Family: From Europe to America, being a history of the Flanders family in America and its probably origin in Europe, (Rutland, Vermont: The Tuttle Publishing Company, 1935). Fischer, David Hackett. Albion's Seed: Four British Folkways in America. New York: Oxford UP, 1989. Print. H. Z. Williams and Bro., History of Sandusky County, Ohio, (Cleveland, Ohio: H.Z. Williams and Bro, 1882), Archives.com (https://archive.org/details/historyofsandusk00 : accessed 8 November 2015).